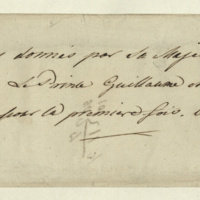 Note by General Jacob de Budé identifying the following papers as orders given by George III when Prince William went to sea for the first time on 13 June 1779. Select a page below to start transcribing. Both pages that need review and that are not started are available to edit. For help transcribing, view the transcription guides. For more information about this document, view the metadata.